Debs and Errol had an indiegogo campaign to help fund their next EP. I don’t know why I’m speaking about them as if I’m not one of them. One of the perks involved knitting. 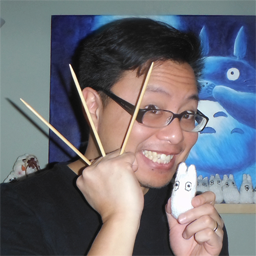 If you donated $50, we would knit you a Totoro Shaker. I would hope that the high price would deter people from actually going for that perk, but people did. And then I forgot that the perk also applied to all the perks above it as well. So in the end, Debs and Errol have to knit 22 Totoro Shakers. We did not plan this well. This will be me. Except less female and more asian. Ok, this will be Debs. Right now she’s working in the farm. She’ll probably start looking like this in a few months. Now Debs has this plan… she has decided that it would be cool if each person who receives a totoro shaker also gets a log of when and where it was knitted. Yes, it’s cool, but that’s even MORE work! Good grief, she has no sense of what takes time and what doesn’t. But it’s a good idea nevertheless. Especially since you can see all the geekery I’ve been up to. This is technically the first totoro shaker. It’s not really, but I have no idea where I knit the other totoro, and I don’t plan on sending it out, so we’ll start with this one. This Totoro was birthed at a Nerd Mafia pub night. You can see me in the back. I’m the one in the back with knitting. Photo taken by John Keigher. Click for his website. The Nerd Mafia is a group of professionals who work within fandom! We gather together, help cross-promote, and just have fun. Through Nerd Mafia I met a number of musicians, artists, authors, cosplayers, journalists, podcasters, developers, performers, actors…a whole geek collective! 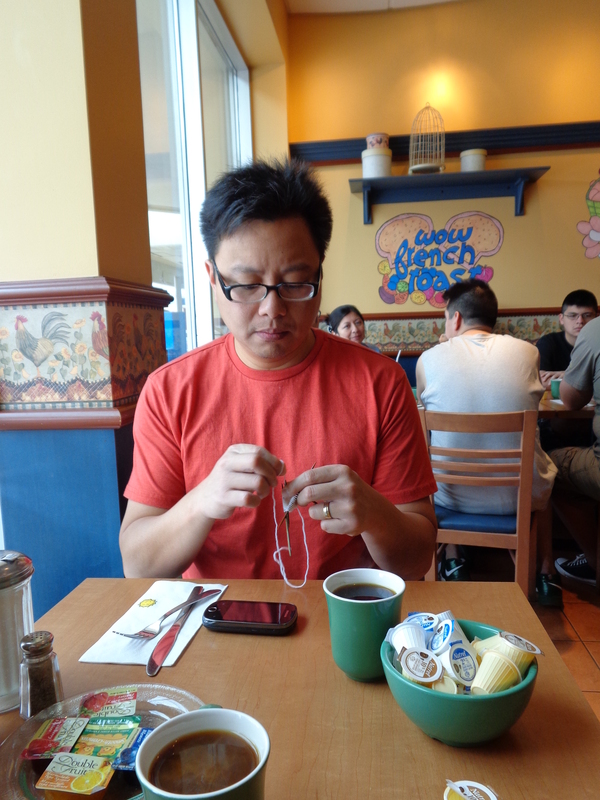 Sadly, do I have proof from this night that I was knitting? No! I don’t and I don’t know why. But there were people there who can attest to the fact that the majority of my night was spent untangling sock yarn since it was a new skein and I hate trying to figure out how to find the end of a new skein. This picture of Adam Ward and Amy was also taken that night. Note that Amy and I are wearing Totoro pins. So it totally counts as knitting. The majority of the Totoro was knit, however, while watching the first season of Doctor Who with the 9th doctor: Christopher Eccleston. Have I mentioned before that knitting has helped me watch more TV? This is a good thing. I never get to watch shows because I can’t really sit for long periods without clicking a mouse or something. Now, I’ve been watching so much Doctor Who that I think I hear the TARDIS when I’m at work and whatnot. Crazy. I am enjoying it, but the first episode was pretty… uh… wow. Not exactly something that would endear me to watch other episodes. Anyway, I take my knitting everywhere now. I have to. 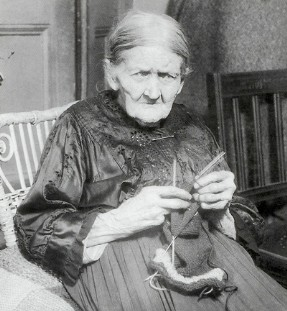 Whenever I have a spare moment where I can sit for more than an hour, I remember to take my knitting. The subway, sadly, is too crowded, and I am only on for 15 minutes at a time. That may be plenty of time, but I want to make sure I’m all packed up and ready to go before I hit my next stop and considering I go from Bus to Subway to Streetcar, it makes that problematic. I don’t want to be jostled while carrying my precious bamboo DPNs! The next place the knitting appeared was at a DoubleClicks Concert. These two sisters are an adorable nerd duo from Portland and they were doing a cross country tour! Alex, from Nerds with Guitars, convinced them to play at the Silver Snail, and I am so glad he did! They were utterly fantastic. I’m in the upper right corner. The DoubleClicks took a picture of us. You can see me knitting. How many days is this spanning now? Many! 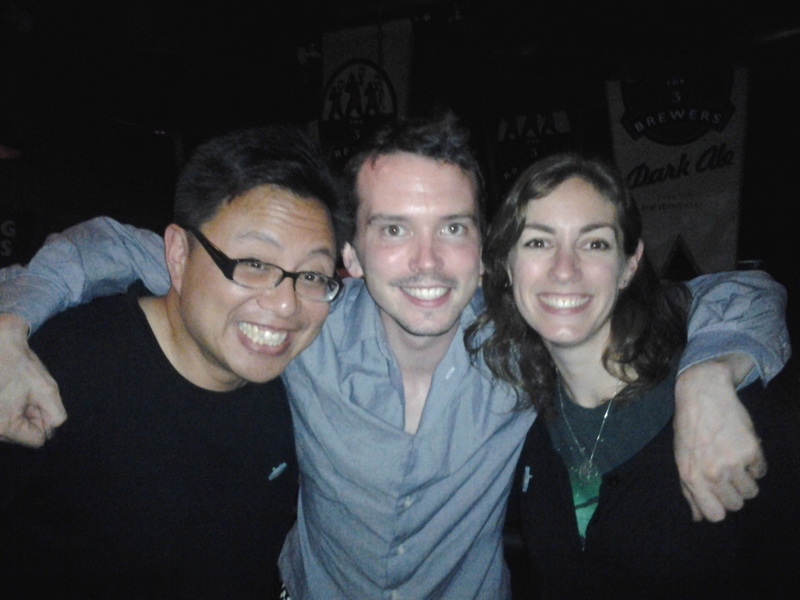 I started the Totoro on June 10th, the night of the Nerd Mafia Pub night, and the DoubleClicks Concert was on June 20th. Good grief, I am taking forever to knit this thing! I had a small getaway with my wife. If you have children, which I do, you understand how important these things are. I didn’t bring my ipad, but I did bring my knitting! I won’t get into the details of that night because my wife thinks I need to work on my boundaries and this is a way of practicing that, but I do have a picture of us at Cora’s the next morning! Wait! Where is my usual pose and cheesy grin? I’m knitting! I can’t pose all the time! …but I finished the body this past Sunday, June 23rd, while I was at a Church barbecue. I could have been social, but no, I was knitting. People at church think I’m weird . And this was before they knew about me and all my geek stuff. Of course, people in the nerd community think I’m weird too. The first is done! Huzzah! 😀 Except for the eyes… I HATE YOU, EYES! Posted on June 25, 2013, in project and tagged DAE, DETS01, totoro shaker. Bookmark the permalink. 6 Comments. 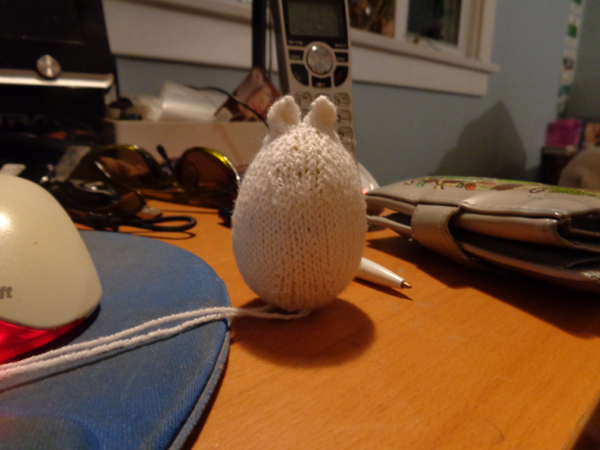 Errol, shouldn’t you put the shaker in before you I guess close the Totoro instead of knitting around it? What?! There’s a time where the Errol isn’t wearing his infamous Errol grin?! I’d say I don’t believe it but there’s picture proof! :O I love this log.